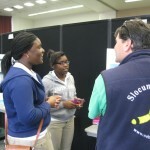 Project CONVERGE Student Research Symposium was a HUGE success! Thank you to all of the teachers, students, and scientists that made it such a wonderful program. Watch a video about the program! 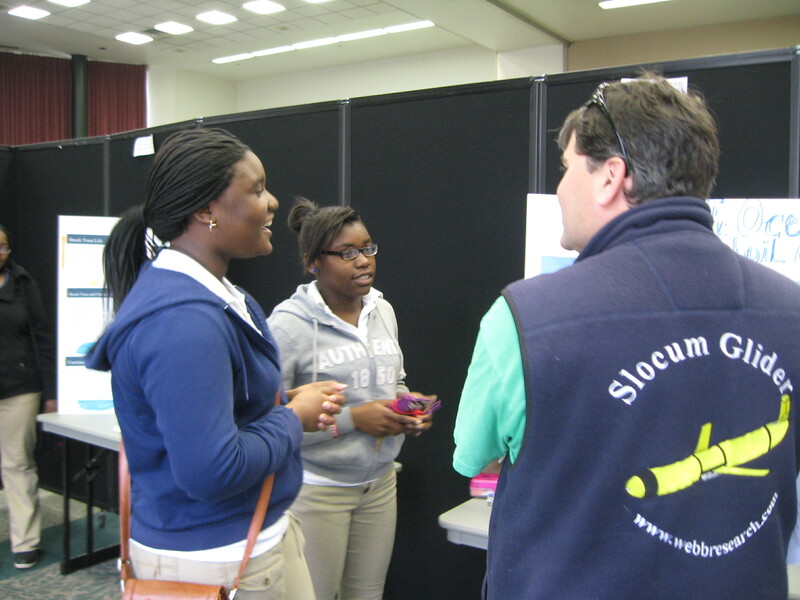 After conducting an investigation or a research review of current information on a topic, scientists travel to professional conferences to present their research to their peers. The Poster Session at the Student Research Symposium will enable students, as scientists, to take part in the same part of the scientific process. Each group will develop and present a poster on their investigations during the Poster Session. Each group will have an area of the meeting room to set up their display. Members of the group will rotate through presenting on their investigation and observing other students’ investigations. At least one scientist and one educator will be assigned to review each poster (as happens at professional science conferences). The agenda for the day has been developed to ensure that each reviewer will be able to spend roughly 10 minutes at each poster they are reviewing. We have adapted the Scientist Poster Rubric that will be used at the Student Research Symposium if you would like your students and fellow teaching colleagues to provide feedback to your students prior to the event (coming soon). To learn more about what goes into a scientific poster and how to prepare, review suggestions by Darci Harland (Getting Stared with STEM Research). View the components of a poster in the Sample Poster mock-up. The poster should include the following sections: 1) title and author names, 2) concept for the investigation, 3) question(s) of the observations you will make as part of your investigation, 4) explanation of methods of testing the question(s), 5) graphs or images of results, 6) description of results, and 7) description of what the results mean for your lives and for the oceans. 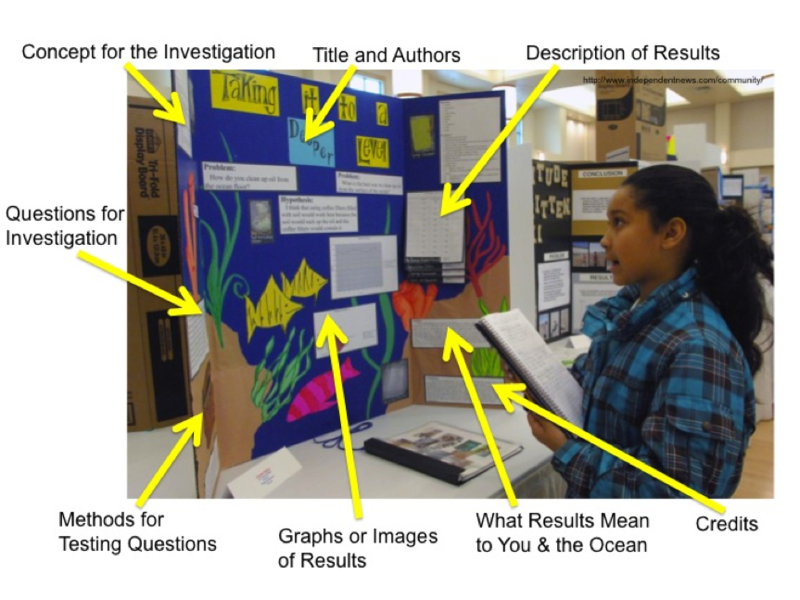 Content on the poster about your investigation can be written or visual, but must convey to the audience the scientific process. All posters must be original and may not contain content that is inappropriate for general audiences. On the poster, the students should include the CONVERGE logo as well as the NSF logo. Posters must comply with copyright rules and regulations. Sources of information and materials used must be properly acknowledged and credited on the poster. All posters should be submitted on a poster board of at least 22” x 28”. Paint, pen and ink, crayon, markers, etc. are all accepted when creating the poster. 10-15 students from each school will have the opportunity to come to Liberty Science Center in May to present their research to at least 5 scientists from the research science team and meet the scientists in person. The DMCS and LSC are not liable for any materials and services purchased to produce the poster(s). Participants assume all responsibility for damages, injuries, and cost. The DMCS and LSC reserve the right to broadcast entries once submitted. Forms of broadcast include, but are not limited to, posts on the Project CONVERGE blog. By presenting a display, the participants grant all rights, title, and interest to DMCS and LSC in broadcasting, but still maintain ownership of the display concept. The DMCS and LSC are not responsible for copyright errors made on the posters. The Project CONVERGE Education Team at Rutgers University and Liberty Science Center is ready to help in whatever way we can. We can help your students to develop questions or design the investigation, to provide assistance undertaking the investigation, to brainstorm poster content, and many other tasks. See our blog post on Science Investigations to learn helpful hints for how to conduct experiments in your classroom.